Please send your question regarding habitat development and gardening for birds to gardening@birdzilla.com. We'll answer as many as we can and post selected answers here. Q. Wildlife doesn't just randomly occur in a given area; it is there in response to habitat which meets its needs. What are the four essential elements of a wildlife habitat, including for birds? A. Food, water, cover (protection from weather and predators) and space to raise a family. Tom Patrick is president of the Windstar Wildlife Institute. Tom's company provides training and certification in wildlife habitat development programs. Thanks to Tom and some of his Certified Wildlife Habitat Naturalists for answering the questions. Q. Feeders are used to supplement the foods provided by trees, shrubs, flowers, crops in food plots, vines and ground covers. What are the different types of feeders? A. Cylindrical, hopper, suet, hummingbird, squirrel and fruit. Do you enjoy observing nature...hearing the song of the chickadee...watching hummingbirds fill up on nectar from trumpet vines...listening to the chattering of squirrels...seeing the beauty and grace of a monarch butterfly perched on a milkweed... experiencing the antics of a Mockingbird...the cooing of the Mourning Doves...the swiftness of the Cottontail...and the brilliance of a Cardinal or Baltimore Oriole? If the answer is "yes", you'll probably want to landscape your property for wildlife so you can experience even more from Mother Nature by attracting more wildlife to your property. Wildlife doesn't just randomly appear in a given area. It is there because of favorable habitat. The essential elements that you must provide in your habitat are food, water, cover and a place to raise a family. To attract the most wildlife, you need native trees, shrubs, groundcover, vines and wildflowers, many of which will provide food and shelter. Native or indigenous plants naturally occur in the region in which they evolved. They are adapted to local soil, rainfall and temperature conditions, and have developed natural defenses to many insects and diseases. Because of these traits, native plants will grow with minimal use of water, fertilizers and pesticides. Wildlife species evolve with plants; therefore, they use native plant communities as their habitat. Using native plants helps preserve the balance and beauty of natural ecosystems. Remember the function served by plants and structures is more important than their appearance. In other words, don't base your planting decisions solely on what a plant looks like. Following are WindStar Wildlife Institute's plant recommendations for wildlife habitats in Utah. Welsh's Milkweed; Autumn Buttercup; Aquarius Indian Paintbrush; Clay Reed Mustard; Deseret, Heliotrope, Holmgren, Horseshoe and Isely Milkvetch; Dwarf Bearclaw Poppy; Flat Tops Wild Buckwheat; Graham Beardtongue; Maguire Daisy; Maguire Primrose; Navajo Sedge; Rabbit Valley Gilia or Wonderland Alice Flower; San Rafael, Siler Pincushion, Uinta Basin Hookless, Winkler Pincushion and Wright Fishhook Cactus; Shrubby Reed Mustard. The Utah Native Plant Society can provide lists of plants for a specific region. 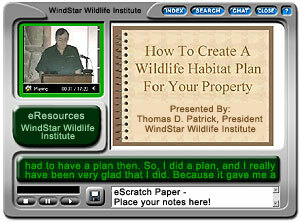 For more information on improving your wildlife habitat, visit the WindStar Wildlife Institute web site. On the web site, you can also apply to certify your property as a wildlife habitat, register for the "Certified Wildlife Habitat Naturalist e-Learning course, become a member and sign up for the FREE WindStar Wildlife Garden Weekly e-mail newsletter. Copyright Birdzilla.com 2003 - All rights reserved.